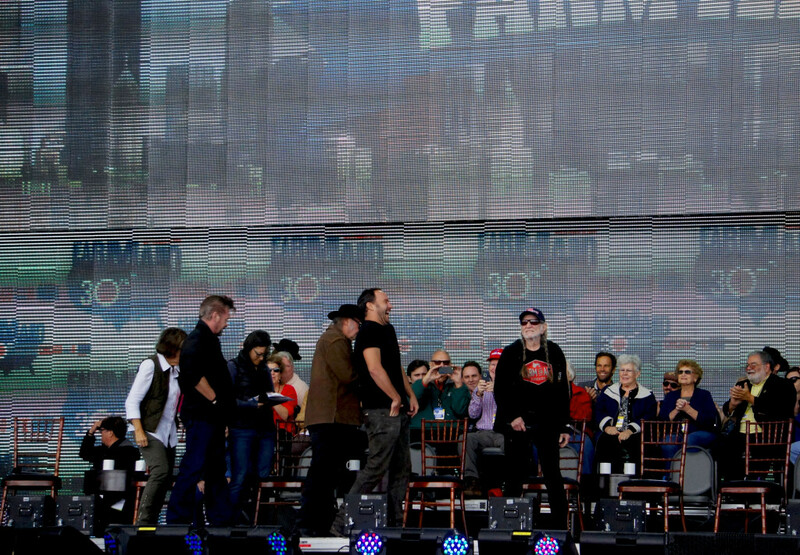 Farm Aid — the organization that has done monumental work on behalf of family farmers and the Good Food movement since its founding by music legends in 1985 — brought its 30th anniversary concert to Chicago on Saturday. As always, the concert was one of the entertainment events of the year, featuring founders Willie Nelson, Neil Young and John Mellencamp, fellow Board member Dave Matthews, and numerous other great performers. But Farm Aid is about much more than the music. 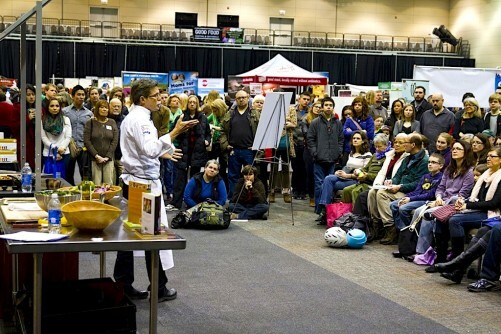 The daytime hours preceding and coinciding with the first hours of the concert were filled with community outreach and education programs about the challenges still facing family farmers and the opportunities for change provided by the rapid rise in public interest in food produced as locally as possible, using sustainable, humane and fair practices. Good Food on Every Table is proud to have had the opportunity to participate in Farm Aid 2015 and presents this photo essay of the daytime activities. A second display, featuring photos of the concert, will be published Monday, followed by an article detailing how Farm Aid’s event over the past week in Chicago worked to raise the profile of its own efforts and those of Good Food advocates here in FamilyFarmed‘s home town. 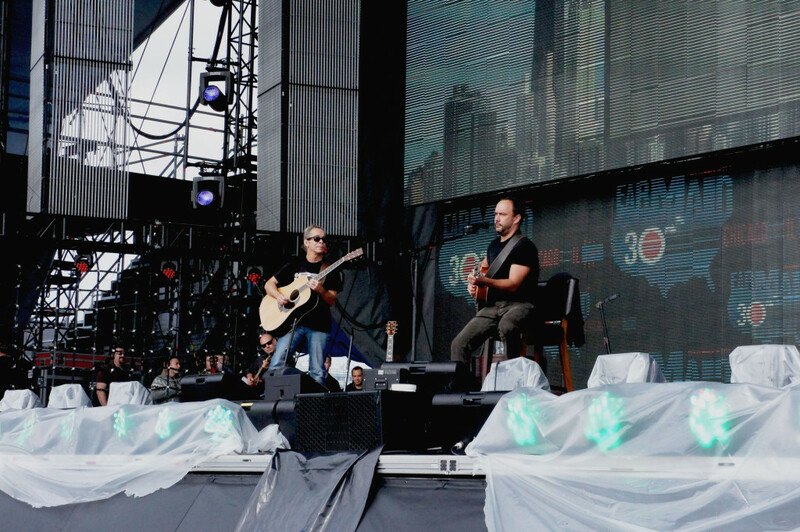 Dave Matthews (right) rehearsed with Tim Reynolds on the morning of Farm Aid’s 30th anniversary concert in Chicago. Matthews joined music legends and Farm Aid founders Willie Nelson, Neil Young and John Mellencamp on the organization’s board in 2001. Neil Young got a laugh out of Dave Matthews as the stars behind Farm Aid took the stage for a news conference on the morning of the 30th anniversary concert in Chicago. Left to right are Farm Aid executive director Carolyn Mugar, John Mellencamp, WBEZ food journalist Monica Eng, Young, Matthews, and Willie Nelson. Joining them on stage were many of the food activists and farmer advocates whose bold and often courageous work was highlighted during the week’s events. Carolyn Mugar, executive director of Farm Aid since shortly after its founding in 1985, addressed the pre-concert news conference. 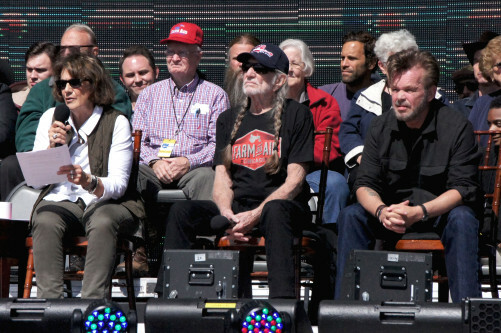 Farm Aid founders Willie Nelson and John Mellencamp are to her left. 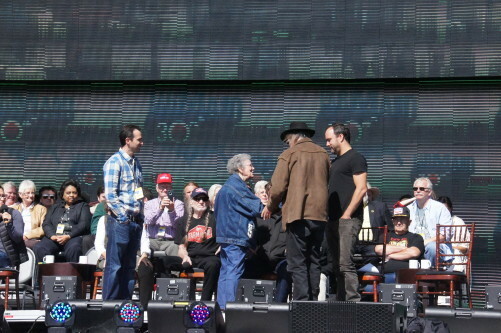 Neil Young (brown jacket) and Dave Matthews (black shirt) greeted Mona Lee Brock of Oklahoma, whose life-saving efforts with the suicide prevention crisis hotline she started during the farm economic crisis of the 1980s were highlighted during the Farm Aid events in Chicago. The farm crisis prompted the establishment of the Farm Aid organization in 1985. 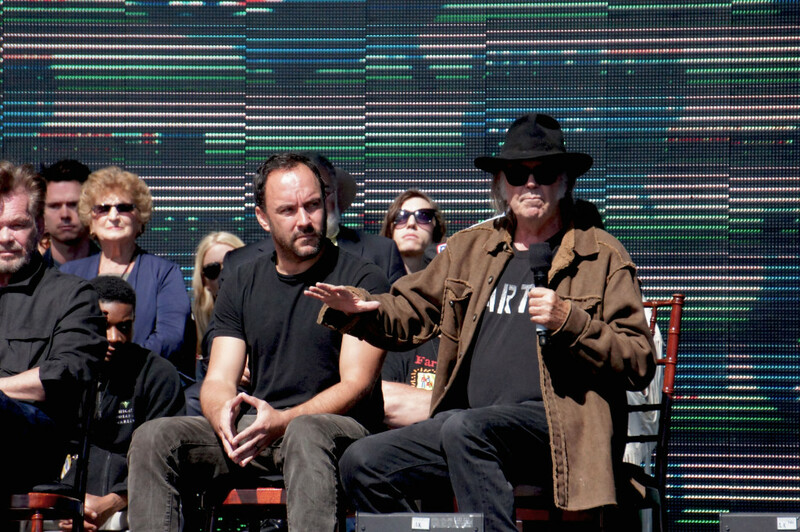 Music legend Neil Young, a co-founder of Farm Aid, made an impassioned statement against corporate control of agriculture and government policies that support it during the Saturday news conference preceding the Farm Aid concert in Chicago. Fellow Farm Aid board members Dave Matthews and John Mellencamp are to his right. 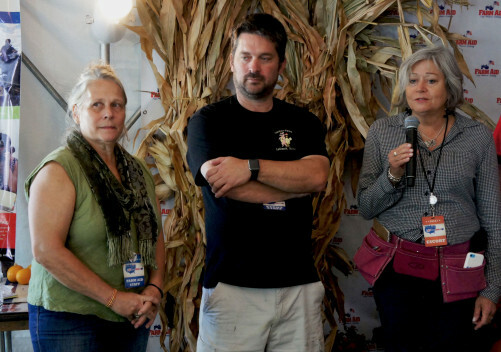 Glenda Yoder, Farm Aid’s associate director, discusses HOMEGROWN Concessions, the food service at the Farm Aid concert that features locally and regionally produced Good Food. To her right are Greg Gunthorp, whose Gunthorp Farms produces meat from pasture-raised livestock in northern Indiana, and Sonya Dagovitz, Farm Aid’s culinary director. The HOMEGROWN Village that took place during the afternoon of the Farm Aid concert in Chicago featured local and regional organizations that work to advance the Good Food movement. The FamilyFarmed booth there was manned by Conor Butkus, a FamilyFarmed staff member. 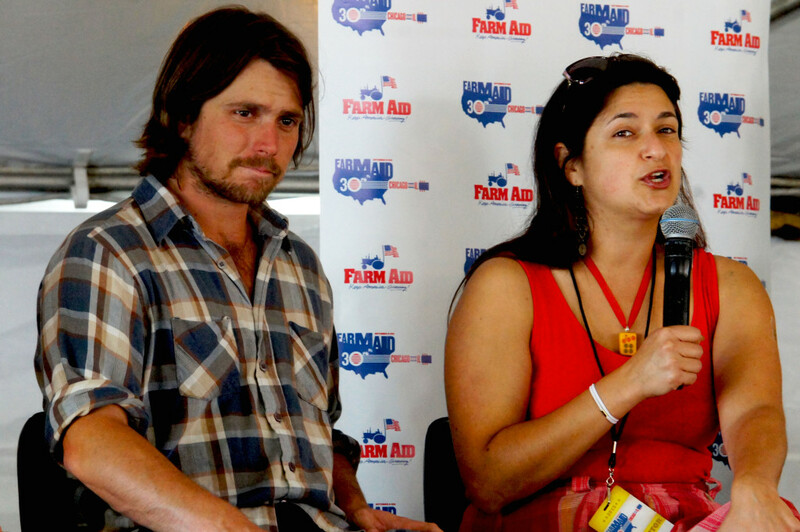 The daytime events at Farm Aid included a series of panels in the Farmyard tent, including one on engaging youths in urban agriculture. 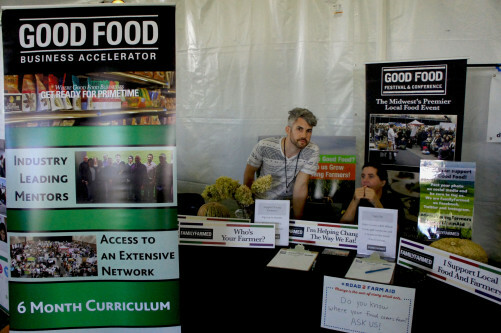 Here, Cortney Ahern of Slow Food Chicago discussed the culinary community’s contribution to the effort. To her right is Alex Poltorak, who founded The Urban Canopy — a Chicago-based city farming and composting company — and participated in the first cohort of FamilyFarmed’s Good Food Business Accelerator that ended in May. 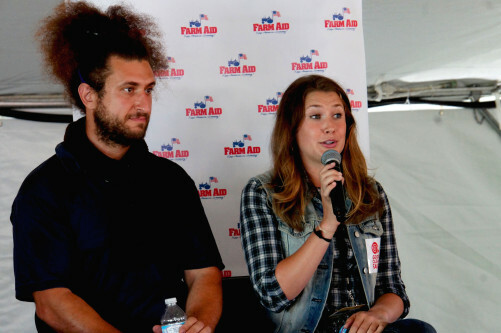 The Farm Aid panel on engaging youths in urban agriculture included Stephanie Douglass, farm enterprise director for Growing Home, a Chicago-based nonprofit that trains and employs lower-income people facing personal challenges to grow organic produce. To her right is Lukas Nelson, a son of Farm Aid founder Willie Nelson, who with his brother Micah performed with their own band Promise of the Real and with their father in the Farm Aid concert’s closing performance. 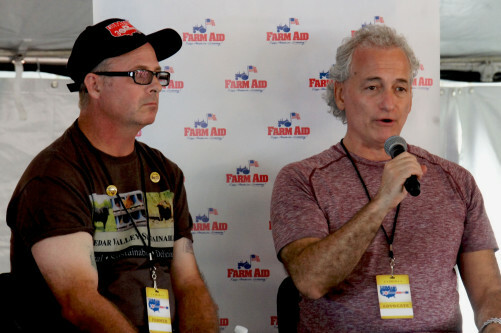 Jim Slama, founder and president of FamilyFarmed, discusses efforts to make local and sustainable food more accessible during a panel at Farm Aid 2015 in Chicago. To his right is Jody Osmund, a sustainable livestock producer at his Cedar Valley Sustainable Farm in Ottawa, Illinois, who is a co-founder of the Band of Farmers Chicagoland CSA Coalition. 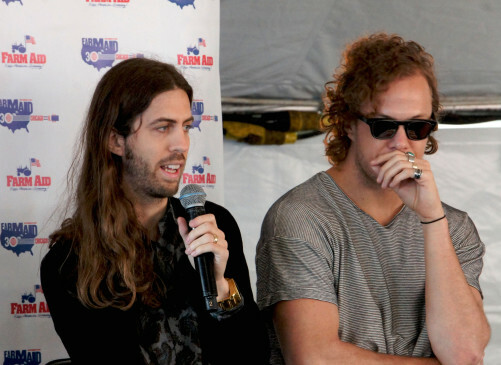 Imagine Dragons, the Las Vegas-based band that has had a string of hit songs over the past few years, participated in Farm Aid 2015 in Chicago. Prior to the concert, band members Wayne Sermon and Dan Reynolds took part in a panel about making local food more accessible. They noted there is a running joke about entertainers’ demands for food at their concerts — such as only red M&Ms — but added that Imagine Dragons’ contract riders require local and sustainably produced food backstage. 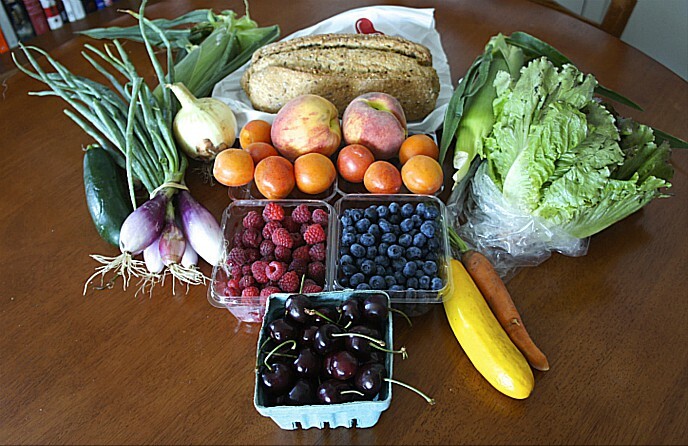 This entry was posted in Community Supported Agriculture, CSAs, Family Farms, Farm Aid, Farm businesses, Food education, Food Entrepreneurs, Good Food Festivals, Good Food Photos, Local Food, Regional food systems, Small Farmers and tagged Band of Farmers CSA Coalition, CSAs, Dave Matthews, Family Farmers, FamilyFarmed, Farm Aid, Farm Aid 2015 in Chicago, Good Food movement, Gunthorp Farms, Imagine Dragons, John Mellencamp, local food, Lukas Nelson, Neil Young, Slow Food Chicago, sustainable food, The Urban Canopy, Willie Nelson. Bookmark the permalink.